This article discusses the various aspects to buying a monitor dedicated to high quality imaging work. You should also read Calibration Versus Profiling and Colour Control On Monitors so that you have a clear understanding of the difference between physical calibration and monitor profiling, and the various methods for colour control on monitors. No matter how good your monitor, it must always be calibrated if you want excellent, accurate results. An explaination of Calibration and Profiling and the differences between them. Buying a monitor for imaging work generally represents a significant investment. But it's an investment definitely worth making if you care about image quality. Of course, like all investments, it's best made with the correct information and unfortunately as ever there's more misinformation than information out there. 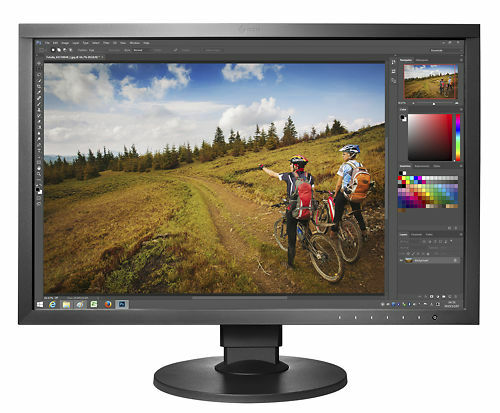 Firstly, what are we ultimately looking for in a high quality monitor as image makers? We are looking for accuracy, and specifically accuracy and control that allows the monitor to accurately simulate our final output medium which is very rarely the monitor we are actually working on. 99 times out of 100, this means simulating the final print as accurately as possible. Accuracy is an entirely different thing to 'pleasing'. It is easy to make a monitor appeal to the human eye on the face of it and much much harder to make one that supports critical viewing of colour and that properly supports the decision making process when making images. It's much the same as with TV shopping. Go to a well set up TV store and all the TVs will have Pixar animated movies playing on them - bright, saturated and impossibly shiny. They make the TVs look great - but tell you absolutely nothing about the general ability of the TV to display colour correctly. The fact is, general purpose monitors are easy to make and are sold in such numbers that their incredibly cheap pricing makes them very tempting - why pay $2000 or even $4000 for a super duper screen when Dell make one for $400? On the face of it, the Dell monitor seems to have good specifications - often specifications that look to be on par with the higher end BenQ, NEC or Eizo models. Even when you look at the screen live, it looks good - high contrast, lots of saturated colour, sharp enough, that sort of thing. The natural reaction is to conclude you're not missing much and that there really isn't that much difference between a general desktop monitor and a proper imaging monitor. But this is wrong. Simply put the Dell (or an iMac, Asus, LG, Samsung, Viewsonic, etc....basically, anything not made by BenQ, NEC or Eizo) next to a monitor designed specifically for imaging work, and display some real images on them, and suddenly it becomes clear that specifications on paper tell very little about the real performance of a monitor. A long list of features with whiz bang names (Ultrasharp TrueColour Overdrive etc etc) does NOT make for accurate, pleasing, and natural display of images. 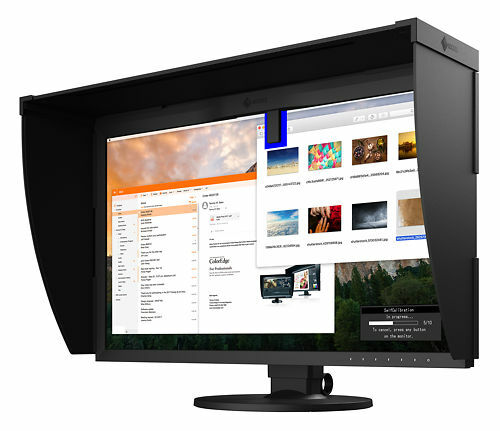 The standard quality desktop monitor is simply lying to you about colour - typically out of the box they are very bright, very saturated, and very contrasty. And nothing like paper. They don't have controls to fix this problem - some of them pretend to have controls but when you actually use these controls, to turn down contrast or de-saturate the image, they actually do more harm than good. By attempting to calibrate these sorts of screens, the net result is a screen with all sorts of post calibration artefacts - the most obvious of which is banding in gradients. One of the key traditional decisions to make when choosing a high class monitor is to choose between a (S)PVA panel and an (S)IPS panel (and, of late the new PLS panels that are also often simply called IPS panels). All types of panel have strengths and weaknesses, but IPS (and now PLS) is generally considered the best panel type for colour accurate screens. (TN type panels - common in laptops - are universally rubbish and should never be used for imaging work). Traditionally, IPS/PLS panels have offered better colour reproduction than PVA panels. That said, PVA panels have come a very long way in recent years and the difference is certainly not what it once was. We have two screens in the office here, one S-IPS and one S-PVA, and I struggle to see any real practical difference in real world usage when sitting in front of either screen and editing images. As long as the panel in question is an excellent panel of its type, there is not a huge lot between them when sitting in front of them. There are some differences though. For example, PVA panels are generally much brighter than IPS panels. This means they tend to be a little less even across their field, and in most cases you turn them down to about 10% of their maximum brightness when calibrating them. The extra brightness can be great for working with video, especially during the day. PVA panels tend to have more variance across their field than IPS Panels. Most people don't find the slight shift in brightness across the field to be an issue of actual practical importance. If you're really concerned about having a perfectly even field, select a higher end model with a uniformity system - all NEC monitors have a uniformity system and Eizo have this system in their ColorEdge range, but not the Flexscan range. A uniformity system will mean the display field will be much more even in both brightness and colour terms. IPS/PLS panels tend to have lower native contrast than PVA panels. See below for more about contrast. This is actually an advantage of IPS panels as lower contrast is in fact better for simulating paper. Another noticeable difference is that if you're sufficiently off angle (i.e. looking at your screen from the side), then the IPS panel continues to display colour accurately noticeably more than the PVA panel. Directly in front, they are uncannily similar, but from the side, this extra colour accuracy may prove to be quite important in certain contexts - such as when showing work to clients. However, IPS screens, off angle, tend to have a slightly blue and weak quality to their blacks, while PVA screens have deep, inky blacks on any angle. So for general imaging use, from front on or within 40 degrees or so, there is not a lot of difference between PVA and IPS panels. 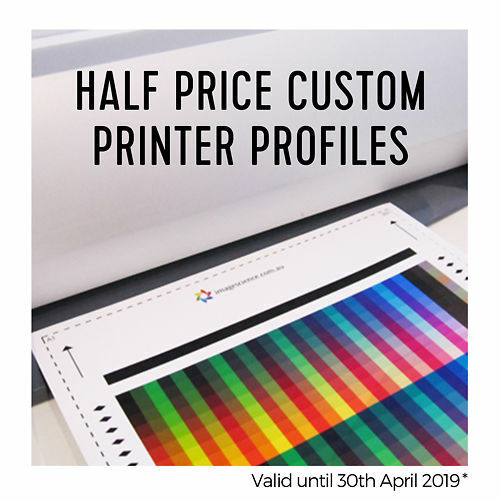 Both offer excellent, accurate, and smooth colour once calibrated, if the panels themselves are high quality and if they are surrounded with excellent stability and calibration electronics - like BenQ, NEC and Eizo monitors. If the budget is there, though, we recommend you do go for an IPS/PLS panel for maximum performance. What to Look For in a High Quality Monitor? In order of most important to least, for imaging work. High Bit Depth Panel Electronics is the most important thing to look for, and having access to them. In short, this means the electronics surrounding the panel can control the panel and adjust its picture (i.e. calibrate the panel) with very high quality. Cheap monitors are usually 6 bit panels and this is disastrous for colour - for example the old 20" iMac uses one of these panels and is, quite frankly, about as bad as monitors get. Typical mid priced panels are 8 bits (e.g. modern iMac screens), which are fine for day to day use but once calibrated these usually display significant problems such as banding in greyscales. This includes pretty much all Dell and Apple monitors, and most general consumer brands like Samsung/Viewsonic etc. High quality monitors like NEC and Eizo have 10, 12, 14 or 16 bit electronics. Remember, the goal is to make our monitor the best simulator for our final output as we possibly can and this means adjusting the entire colour response of the monitor. Typically, white point colour and brightness, RGB gamma (or tonal response from dark to light), and black point are adjusted. When these adjustments are made on standard monitors (6 or 8 bit), they quickly induce artefacts as only a maximum of 256 tonal levels are available to begin with, and all adjustments during calibration will reduce the number of levels. Insufficient levels means visible banding. With higher bit depths, more levels are available, and even in post adjustment, plenty of levels are still available. This means no banding and no tonal compression in shadows and highlights, as a result of adjusting the monitors display closer to paper. This is fundamental to accurate image display. High bit depth makes a panel flexible and accurate, and high bit depth panels simply aren't available in consumer brands. 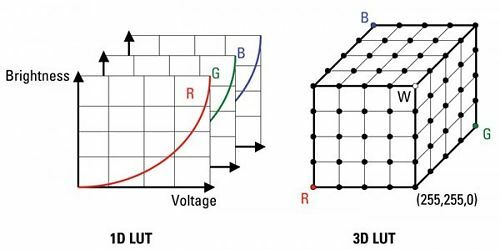 High bit depth in the panel electronics is the primary thing to look for, but you must remember that this is only relevant to the calibration stage of monitor colour control. That is, these high bit depth chips are used when physically adjusting the monitor, but not necessarily during the second stage - profiling the monitor. See point below. This is a very useful feature to have. It means in the second stage of monitor colour control, i.e. profiling, all the adjustments are made directly into the high bit depth LUT tables in the monitor itself. Basically these high quality monitors include a very high quality video card in the back of them!. In cheaper monitors, these adjustments are made to the video card's 8 bit LUT instead - and again, this typically induces artefacts. Above and beyond that, it is also usually the fastest and easiest way to calibrate & profile a monitor, you don't have to touch the monitor's controls as it's all taken care of for you - just define your settings and let the system do the work for you! You can go make a cup of tea while your monitor adjusts itself to perfect colour! There's no real specification that tells you this, but there are certification tools that can measure this. BenQ, NEC and Eizo monitors, in particular the high end monitors in the BenQ PC, Eizo CG and NEC SpectraView lines, leave the factory calibrated to a standard that is simply unheard of in the consumer market. This means when you first set them up, even before calibration, they are fundamentally far more accurate than anything you're likely to have seen before. 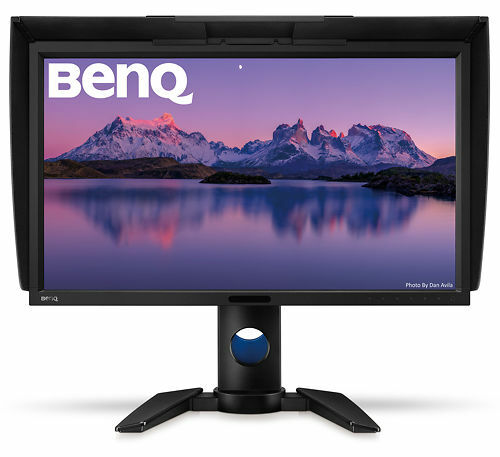 BenQ, NEC and Eizo monitors are really the only brands readily available in Australia that can pass the very stringent certification tests from professional standards bodies like UGRA/FOGRA/ISO etc. While passing certification is not necessarily something required in everybody's workflow, the ability to hit these accuracy targets and hold them is precisely what makes these monitors so good at their primary function - simulating the final printed output. Good monitors must have extensive controls for adjusting their picture to appropriate targets. Most importantly is a brightness control that can drop a monitor's display down to a reasonable level to simulate paper - ideally anything between about 60 to 200+ candelas should be achievable. This is where many consumer monitors fail absolutely. For example, some older iMac 24" screens have a minimum brightness of 250 cd/m2 and out of the box they are a truly retina destroying 400 cd/m2!. This is ridiculous and a huge fundamental failing for image makers - an approximate recommendation for most working environments for print production work would be brightness of around 90 to 110 cd/m2. This means the iMac is, at best, two and a half times brighter than it should be to simulate paper, and there's no physical control to adjust this. With such a 24" iMac you will forever find your prints seem darker than your screen. In addition to a brightness control with sufficient range, monitors must have excellent controls to reach specific gamma targets (i.e. have an appropriate tonal progression from dark to light) and specific colour targets (e.g. white points in the range of about 4500 to 7000 Kelvin). Many cheaper monitors seem to have these controls, but remember the issues above with low bit depth panels. They are doing their adjustments with low bit depth maths and this means using these controls will induce visible artefacts such as banding, tonal compression etc. On good monitors, all of these physical calibration adjustments are done in the higher bit depth chips and the result is no artefacts once you have physically adjusted your monitor. Monitors like the BenQ SW and PV series, and Eizo ColorEdge screens, now accept a 10 bit input signal from high end video cards. The result of 10 bit input is that the incoming signal is much higher quality - having over 1000 discrete signal levels instead of the normal 256 signals with 8 bit input. The net result is smoother, more accurate colour and a more robust system that can stand greater manipulation (for example, calibrating to printer gamuts in the monitor hardware itself and other exotic things). What 10 bit video output is, why it matters and how to get it working. LCD monitors have inherently high contrast. This makes them look appealing initially, and is great for movies and games - but it also makes them struggle with simulating paper, which is inherently a low contrast medium. Print contrast varies depending on the paper and inks used, but a rule of thumb is about 200:1 is an appropriate contrast level for simulating paper. High end LCDs (BenQ PV, Eizo CG and NEC SpectraView) offer control over contrast - that is, these monitors can reduce the native contrast of the panel to a level much more like that of paper. They do this by letting you set specific target points for the brightness of both the deepest black (black point) and the brightest white (white point). The contrast ratio of a monitor is calculated by dividing the white point by the blackpoint - for example, a white point of 100 candelas and a black point of 0.5 candelas means 100/0.5 or 200:1 contrast. Simulating paper contrast is a very important part of print matching. An image on a screen with 1000:1 contrast will always look far more contrasty than the final print and this means your editing decisions will be based on this incorrect display. Because of the way LCD monitors work, basically a bunch of filters in front of fluorescent tubes or LED back lights, they are inherently uneven across their field in both brightness and colour. On large, low quality monitors especially, there can be HUGE differences across the panel. Open a grey scale image in Photoshop and then open a second copy of it (Window->Arrange->New Window For....[filename]). Move the two windows around your screen (e.g. to opposite corners) and compare them. You will typically see significant variance in brightness and quite possibly in colour as well - for example, Apple Cinema displays are notorious for colour casts in the corners. If you tend to retouch images side by side, this can be a significant problem. If the variance is only minor and around the edges, it may not be a big practical problem, but if, like most people, you display the image your working on full screen across your entire display, on a typical 'normal' monitor there may be as much as 30% variance in brightness across the image - meaning for example, the left hand side of your image will look artificially brighter than the right purely because of a uniformity issue. If you edit your image based on this, you may simply be damage your image in an effort to make up for the deficiencies of your display. Almost allNEC monitors, Eizo ColorEdge(but not Flexscan) monitors, and BenQ P series monitors are uniformity corrected. Essentially, this means before the monitor leaves the factory, it is measured across the entire field in a bunch of separate zones (e.g 16 or 25), and then each zone is individually tuned to make sure the display is even across the entire field, within reasonable tolerances. The BenQ PV, NEC SpectraView and Eizo CG tolerances are particularly tight and the screens are essentially even across their entire field. Note: this is a once off factory calibration - once several years have passed (3+), the panel may realistically begin to show some visible unevenness again. But because the original tolerances are so tight, it will be some significant time before the level of unevenness gets back to a point where it poses a practical problem (and in say 10 years, we imagine all screens will likely have uniformity systems!). Good quality LCD screens must have a matte surface, not a shiny, reflective gloss coating. Gloss is bad in every way - it increases contrast, which we don't want, and it dramatically increases the reflectively characteristics of the screen, which is again very bad. High quality screens all have very matte surfaces that minimise reflections and allow for a very pleasing, natural display. Very high quality screens have lens grade coatings on them for extremely high quality display, and this gives images on these screens a wonderfully natural, three dimensional quality. Gamut is the total range of colours a screen can display. Standard gamut is roughly the size of the sRGB colourspace - about 76% of the AdobeRGB colourspace, which is pretty much the standard colour space recommended by most professional bodies in Australia for RGB work. Standard gamut, in more human terms, is roughly the amount of colour a typical television set can display. New and high quality monitors are beginning to support a wider gamut than traditional monitors - up to 102% of AdobeRGB colours are displayable on these screens. Meaning they can be used for high saturation work with greater accuracy. While this is handy, truth be told the vast bulk of work can be done on standard gamut monitors without trouble But as cameras and printers get better, wide gamut support is becoming increasingly important. Good on screen controls are very important, especially on monitors without direct hardware calibration! Most monitors have pretty awful menu systems. The NEC monitors in particular have excellent, easy to use controls. Consumer monitors typically have 12 months warranties and quite frankly they seem to be made in such a way as they drop like flies after those 12 months are up. Update 2017 - NEC have drastically and unfortunately changed their warranty conditions. Please read this statement. NEC have a 15 day Zero Dead Pixel and DOA period across their entire range - so if anything at all goes wrong during the first 15 days you are completely covered and get a replacement screen, no fuss! Then you have three years of full parts and labour warranty support. This is excellent and we think overall it is probably the best warranty in the business. In practice, we have found NEC's support to be good and quite quick. Eizo have a 5 year warranty - and their support, rarely drawn upon thanks to the quality of their product, is fantastic. You should of course read the full warranty here as there are some limits and you should check pixel coverage etc. 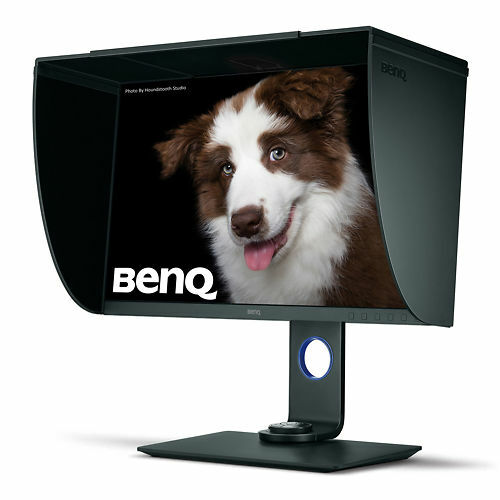 BenQ also have an excellent warranty for monitors specifically purchased through us - 6 months dead pixel free, and 3 years general warranty. While many other manufacturer's claim to have this, its worth reading the fine print very carefully. Typically the coverage is only for the first few days, which is reasonable as dead pixels are a manufacturing fault and do not appear during a monitor's life. But there are often also restrictions on the coverage if the pixel is near the bezel edge, for instance. Some restrict the coverage to a very small part of the screen in the dead centre - not very useful on a massive 24" monitor! So read the fine print on this if it is of big concern to you - the reality is that while it can be annoying, a single dead pixel is a tiny, tiny fault in an otherwise perfect screen, and it really causes no more practical harm than a speck of dust on the screen. This comes down to budget and desk space - bigger is always better! That said, we thoroughly recommend you buy a high quality small screen rather than a low quality big screen if the budget is limited. The best is of course a big, high quality screen, with around 27 inches being just marvellous for editing big images, seeing double page spreads, etc, with room for palettes. But plenty of folks are still using 24" screens. Anything smaller is probably not worth it at this point. How to successfully calibrate dual or multiple monitors on a Mac or PC. An alternative is a second cheap screen as a palette monitor and this can be a very cost effective way of increasing screen real estate - and the quality of the second panel is almost irrelevant as it is just for palettes. Be aware that under Windows it is likely you will not be able to calibrate the second screen without using two video cards (see article on Calibrating Dual or Multiple Monitors). For specific recommendations see our Colour Accurate Monitor Buying Guide below. 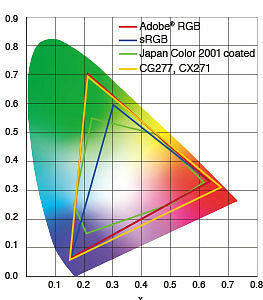 Image Science current list of recommended colour accurate monitors.